In Kingston, Oklahoma, photos tell the story of what United Methodist volunteers accomplished for a single parent and her children. In 2015, a tornado destroyed their house. 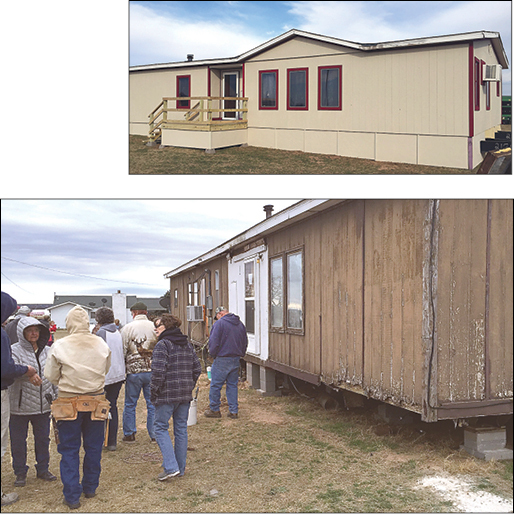 With FEMA funds, they purchased a used mobile home, despite its obvious signs of needed repairs. Recently a volunteer team of members from two churches signed up with Oklahoma Conference Disaster Response Ministry and deployed to help, according to OKUMC-DR Supervisor Chad Detweiler. They replaced siding and built a front porch and ramp, among other projects, creating a welcoming home for the young family. The workers were from Third Base Ministry, Nokomis UMC, Illinois, and Mission 1-8 Team, Island UMC, Iowa. If you want to help others impacted by disaster, call 405-802-0904 or email volunteer@okumc-dr.org.